I’ve never been to Ibiza, nor to Rimini, in the summer, but if I have to describe a place that can help you understand what it’s like at Patong Beach, in the district of Phuket in southern Thailand, then think of a mix between the two, united by an unlimited number of nightlife spots, outrageous entertainment and tourists looking for noisy relaxation. Basically, my idea of hell. My route to wellbeing follows a totally different route; one of quiet, daylight and exploration. In order to enjoy Patong, I decided to suspend judgement and abandon, as far as possible, any presumptions on wellbeing according to my own rather rigid standards. And it worked, as you will see from the story I am about to tell you. Patong Beach is teeming with seafood restaurants: plastic tables and chairs, paper napkins, greasy menus and tubs of fish ready to be chosen and cooked. Something between a prawn festival and a kitchen campsite surrounded by shellfish. Filled with people from all walks of life. There are very real doubts over the quality of the food, but what was it we said? You have to trust what the street has to offer, and today I decided to put my trust in a waiter with antennae on his head; a him, or actually a her. The manager of the restaurant, Toni, is a famous homosexual figure in Patong: open shirt, garish necklace, he speaks several languages and stands outside checking that everything is going well. All of the waiters are transsexual, dressed in bright red clothing of varying skimpiness, and with bizarre accessories. 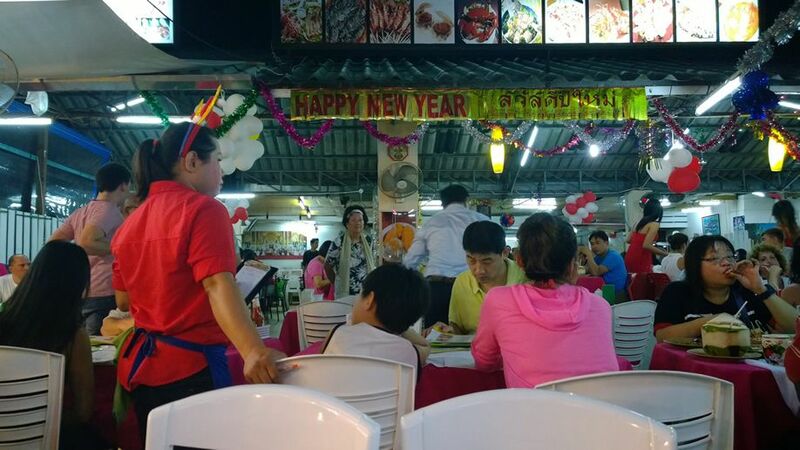 No one seems to pay this any attention, not even the little boy in the photo who looks only at the menu. In the background, balloons and garlands, photos of the main dishes on the menu, families, couples, single diners. I suspended judgement for the photographs too, and let myself be guided by one single principle: capturing whatever you have in front of you. In this situation, it can be useful to set a fast shutter speed, so that you really to seize the moment. 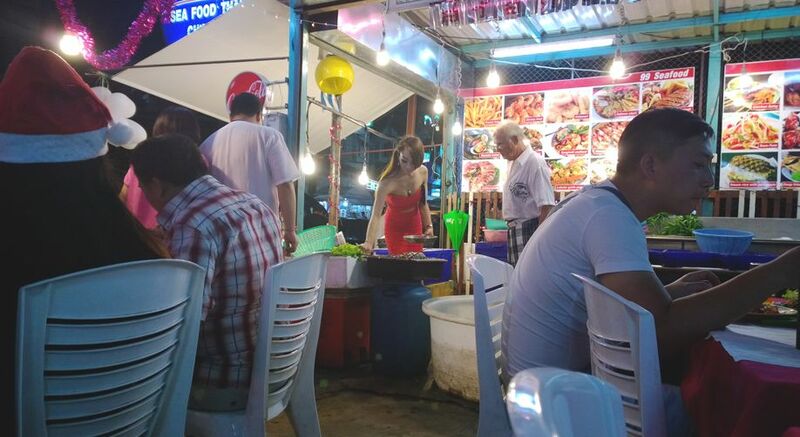 As in the image below, where an elderly man is choosing his dinner, helped by a beautiful girl: the only appetite I noticed was that of the stomach, and not just because I’m a bit naive. In Patong, there is a great freedom of sexual behaviour, and this leads to an unusual normalisation in terms of prudery: everything sexual is out in the open and on offer to everyone, so that it just becomes part of the scene for the tourists who, after the third day, pay more attention to a live sea bass than a bare back. I chose to keep my camera at table-level, creating an image bursting with the whole normality of the situation. 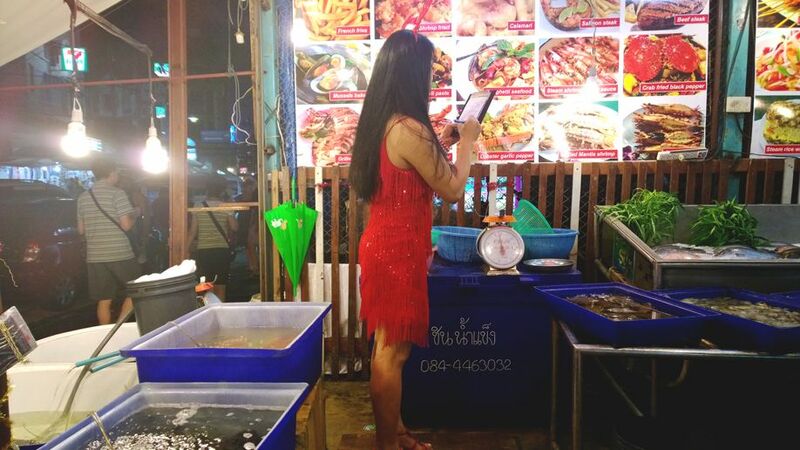 In the seafood restaurants, you choose your fish: fish and shellfish (the latter always live) at the restaurant entrance swim or walk in plastic tubs, so that you can look your dinner in the eye before eating it. 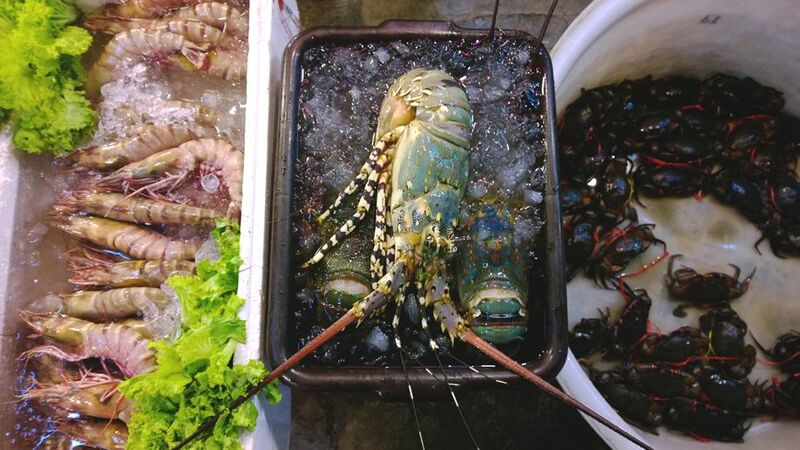 Like these beautiful blue lobsters, in large family format, with lively antennae and bright colours. I left them in the centre of the photo, widening the aperture to make them in focus, and leaving the crabs and prawns in the background. 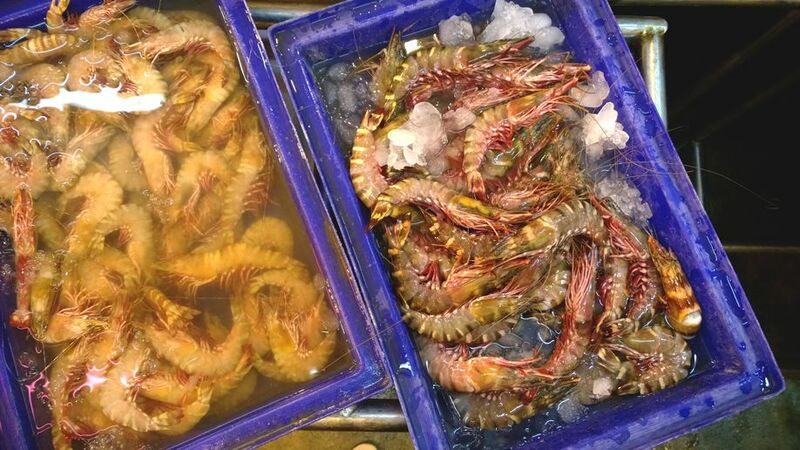 I opted for some prawns: the tubs are well-used, filled to the brim, ready to be refilled again and again. I chose them because I love sucking out the juices from their heads, and this photo clearly shows that these ones look promising. 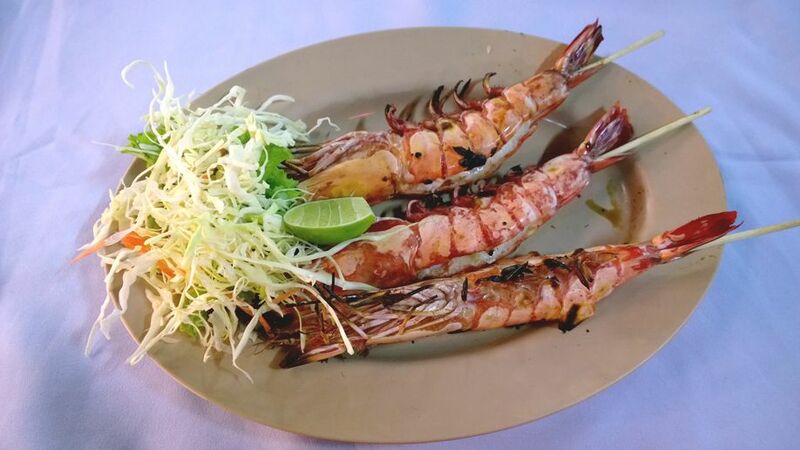 After days of sauces and spices, I asked for my prawns to be simply grilled. I waited about 15 minutes, whilst I sipped on my beer and observed the tables around me. The seafood restaurant chatter got ever louder. The later it became, the more young couples arrived; the tubs of fish emptied, and I thought that, all things considered, Patong wasn’t that bad at all. And in the end, when my prawns arrived, I devoured them with delight: meaty, with a squeeze of lime, to be eaten with your fingers in a place where it is custom so to do. Photographing them was more difficult: a creased paper placemat, a mud-coloured plate, no styling opportunities at all. Here below, I got it wrong: I should have turned the first prawn to match the direction of the other two, to give the image more harmony. Therefore, take note, dear friends – do not make the same mistake! After eating the best-dessert-in-the-world, otherwise known as sticky mango rice, I paid the bill and left: the last picture I took was of the waitress with the Charleston dress. I took her side-on, concentrating on taking orders, leaving the street, the plastic tubs, the green umbrella to the left. She stands in the centre, her fringed dress highlighted naturally but without too much expressive force. Patong Beach is a bit of all of these: characters, smells, sounds, outrageous places, that all make up a human landscape immersed in a never-ending climate of festivity. If you want to put all of theses into images that talk of daily life or of exceptions to the order of things; if you choose one evening to enjoy seared prawns whilst a waiter in a fringed dress sells a lobster to an elderly diner, it’s up to you: for me, abandoning my usual point of view for a while was a truly wonderful experience.